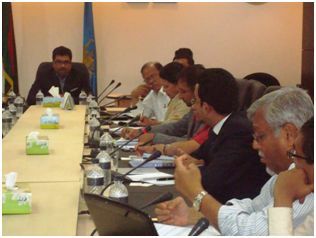 A private sector consultation meeting on Public Private Partnership (PPP) Operationalization was held on 10 th June at the Dhaka Chamber of Commerce and Industry (DCCI). The consultation meeting was jointly organized by the Business Initiative Leading Development (BUILD) and the PPP Office. 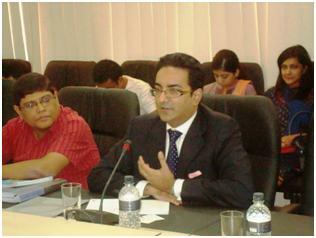 It was chaired by Mr. Asif Ibrahim, President of DCCI and Chairman of BUILD. Business leaders, officials from PPPO, Ministry of Finance, and ADB TA team members attended the meeting. The objective of the consultation meeting was to raise awareness about PPP among the private sector, discuss the preparatory work done on PPP, including the PPP draft law, and to highlight how private sectorpartners can participate in PPP projects. Giving a warm welcome to all invited guests, the President of DCCI, highlighted the high expectations of the business community regarding the investment opportunities that would be made available by the PPP program. He emphasized the importance of accelerating the development and implementation of the PPP programmeand expressed his hope that through consultations like this, and the combined efforts of the public and private sector, the PPP program in Bangladesh can become a success. The CEO of PPP Office, Mr. Syed Afsor H. Uddin in his opening remarks highlighted that the global experience of PPP has shown that, where implemented properly, PPP can deliver benefits to both the public sector and private sector. Many countries had been successful in delivering large PPP programmes, for example in the UK a multibillion dollar program had been developed, while more recently there has been a rapid implementation of PPP projects in India. The CEO of the PPP Office stressed the importance of continued dialogue and communication with the private sector in helping to make the delivery of the PPP Programme in Bangladesh a success. Dr. M. Fouzul Kabir Khan, Team Leader of PPP Technical Assistance Team for the Asian Development Bank delivered a presentation to set out the PPP concept and how the various draft manuals provide an end to end guidance on the delivery of PPP projects. Following the presentation on PPP, an engaging and informative discussion took place among all participants where the PPP Office responded to a number of clarification questions raised by the private sector participants about the process and policy for development and implementation of PPP projects. Ms. FerdousAra Begum, CEO of BUILD then thanked all participants for theirsuggestions put forward in the meeting and hoped that more of such meetings will beheld in the future and will contribute to the success ofPPP program in Bangladesh.